No better way to kick off the summer than to showcase one of our power users, who despite using MarketGoo for a short time, has had quick gains. 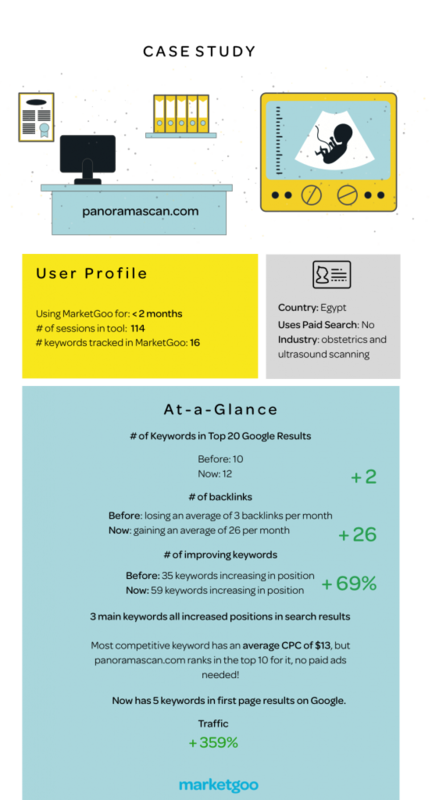 While this is not a typical scenario, this user’s dedication to his site’s SEO and focus on specific keywords really gave him the upper hand for his site panoramascan.com. This site had some unstable traffic resulting from Google’s regular fluctuations as well as the rumored May and June updates. Nevertheless, it had extremely strong branded keywords (that rank in the top 10 within the target country, as well as from other huge markets like the US and UK) that it tracked and worked on with MarketGoo and continued to build links. This gradually recovered it’s traffic and rankings. How do you know if you’ve been hit by a Google update? If you notice a sudden drop in traffic and rankings, check SEO news sites (or if you’re a MarketGoo user, ask us) for news related to a possible update in that timeframe. Then you have to determine if your own site is perhaps violating the Google guidelines. The user has been using MarketGoo for less than 2 months, and yet completed a total of 114 sessions within the MarketGoo tool, and we can definitely say that made a difference: the more time you dedicate to your site’s SEO, the more tangible results you’ll get. This website is in an extremely competitive global industry and proves that with regular usage of an SEO tool, you can maintain and improve your results yourself and not be reliant on paid ads. Below, check out the gains panoramascan.com got with MarketGoo! Struggling with your traffic and rankings? Remember, you can get a FREE 10 day trial of MarketGoo when you click Sign Up below!